Kirsten Court is determined to land the position Robert Reyes, the CFO of Powers Corporation, recently posted. Her friend Mrs. Bellows has been his assistant for years, and now suddenly she needs an assistant! but Kirsten has heard the rumors that Rob will requires… extra duties from this new hire. But for Kirsten that won't be a hardship, as Rob is young, handsome, intelligent, but that doesn't stop Kirsten from calling him a B***tard every time she see him. After her "steamy" interview, Kirsten is even more determined to get the job and not only to protect Mrs. Bellows. But when she finds out the real truth, about the assistant to the assistant position and the fact that Rob was going to resign because of John Power's non-fraternization policy, it makes Kirsten see Rob in a completely new light! Maybe someone she could give her heart to? So we are back with another book in the City Sizzle series and I will 100% admit that the author has completely out done herself with this story! Seriously, what is not to love! A high powered CFO protecting his assistant and lusting for the woman of his dreams, he is even willing to give up his job in order to have him, until she falls in his lap, the plot if this book is seriously to die for. The writing is fantastic! and is distinctly, Cynthia Sax. The characters were amazing! Rob is intelligent, articulate and delicious! Kirsten is sassy and sarcastic but has a heart of gold. But Mrs. Bellows stole the book for me and you honestly can't help but love her. 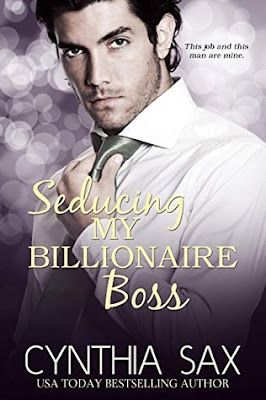 I give Seducing My Billionaire Boss 5 stars! And I can’t wait for the next installment of the series.